Qualifying for the Brazilian Grand Prix was a story of tires. The temperatures were high ” higher even than in Malaysia two weeks earlier ” and this meant that Michelin had the advantage ” or so it seemed. Interlagos is a circuit which is tough on tires and so a much harder compound of rubber is required. For Bridgestone there was the additional problem of having to supply tires for two different Ferraris: the older F2001 chassis and the single F2002 which was taken to Brazil for Michael Schumacher to race. Michelin is also a much stronger challenger than it was in Brazil last year. "Things have moved on enormously in the past 12 months," said Michelin's Pierre Dupasquier. "Remember last year's Brazilian GP was only our third event back in F1 and we were still trying to work out how to deal with grooved tires." Not so in 2002. Michelin is on the attack and Bridgestone is not having an easy time of it. In Australia the unexpectedly low temperatures favored the Bridgestones but in Malaysia and Brazil the Michelin were the tires to have. And there was not much argument about it. Michael Schumacher managed to scramble the new F2002 onto the front row of the grid but he was the only Bridgestone car in the top six. "We need to work harder to improve," said Bridgestone's technical manager Hisao Suganuma. The battle for pole position was always going to be a battle between the two Williams men although Michael Schumacher's virtuoso skills mean that there is always the possibility of a little magic. David Coulthard and Kimi Raikkonen were there or thereabouts but at the moment the team is not quite convincing enough as a frontrunner. The chassis looks good; the drivers are good; the tires are good; but there is something missing. Horsepower. When one starts to mention horsepower figures one makes enemies and so it is best to say very simply that the Mercedes-Benz V10 engine appears to be lacking about eight percent of the power that the BMW engines are kicking out. Having said that Interlagos is one of the tracks where horsepower is not the deciding factor. There are the fast blasts up and down but the middle sector is all about handling, tires and drivers rather than about screaming horses. This may explain why the McLarens were looking a bit better. The Williams-BMWs are good chassis but one gets the impression that they could be more efficient and one is left with the impression that while the Ferrari package is the best compromise of all the elements, the best combination to combat the red cars would be a McLaren-BMW! Getting every element together at the same time is the secret of success in F1 and one must congratulate Ferrari on doing that at the moment. The fact that the Ferrari was as close to the Williams-BMWs as they were was testament to the package that Ross Brawn and his crew have produced. The F2002 is needed now and the rival of one of the cars in Interlagos made things a little more interesting, although the machinations over the tire supply did rather spoil the whole thing. The question of Ferrari wheel rims was really not that exciting so long as the number of tires used was not abused. There were rules which were open to interpretation but it was not really worth the fuss that was made. In the end Michael Schumacher split the two Williams-BMWs, which was a very good effort. The new F2002 is better than the old one ” even if the reliability is still a worry. 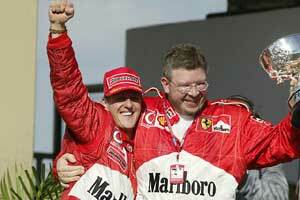 "We wanted to be on pole," said Ferrari technical director Ross Brawn. "but it is impossible to be dominant at every track. I am not too despondent about it." Ferrari's challenge was blunted somewhat by Rubens Barrichello being given a penalty for driving through a red light at the end of the pitlane on Saturday morning. This meant that Rubens had to drop his best qualifying time. As things turned out it did not cost him a position as his second best lap was only a fraction slower than his disallowed time. But either way, this left him down in eighth place on the grid ” a big disappointment for the local hero. The only other Bridgestone runner in the top 10 was Nick Heidfeld who made it to ninth place. Michelin thus had the cars which lined up first, third, fourth, fifth, sixth, seventh and 10th. "We're in good shape," said Dupasquier. The rest of the story was more or less what one would expect to see with the Michelin men at an advantage. Renault Sport continues to claw its way forward with Jenson Button just a hint of a second slower than Jarno Trulli. The Toyotas were doing well again with Mika Salo 10th but Allan McNish was down in 16th after running over a curb. The Jaguars looked better (for a change) with Pedro de la Rosa 11th and Eddie Irvine 13th . As qualifying sessions go it was not a bad one but there was none of the high drama that one gets from a classic session. Hopefully as the year goes on we will see more and more excitement. "There are going to be other circuits which suit us," Michael Schumacher said. "That's the way it is going to happen this year. It is going to be up and down between the circuits." It looked however on Saturday night that the only way Ferrari could hope for a win on Sunday would be if the rains came ” and there was no sign of that happening. F1 nodded and with sweaty brows concluded that this was "Michelin weather" and that Ferrari was going to have a real struggle to beat the Williams-BMWs. The warm-up was a lively affair thanks to Enrique Bernoldi who did not show an enormous amount of intelligence when he stuffed his Arrows (big time) into the wall at the bottom of the hill at Turn 2. He was going too quickly and dropped the ball. The car was seriously smashed up and provided a spectacular sight as it flamed gently thanks to fractured bits and pieces. The crash occurred right by the Medical Car and there was a very frightening moment when this went to help out Bernoldi. As the driver Alex Ribeiro opened the door of the rescue car, it was hit by Nick Heidfeld's Sauber which had nowhere to go. A split second later and Ribeiro would have been climbing out and would probably have been killed. The mess was cleared up and the crowds gathered and still we all talked about Michelin and how Michael Schumacher was going to have to stop twice. We wondered if any of the Bridgestone men would go for three stops. The story of the race was not so much one of careful psychological games and tactics but rather of the first lap clash between Schumacher and Montoya because if Montoya had been there and stayed ahead all of Ferrari's clever plans would probably not have worked. But one way or the other Montoya was taken out of the action again. This time he was not willing to sit back and be polite. He had had enough. "In the last race we came side by side into Turn One and his front wing got engaged with my car and they gave ME a penalty," he raved. "Now he has chopped in front of me and taken my front wing off. The minimum they should do is a drive-through penalty. "The FIA is amazing. They don't have any consistency. It's always the same thing. It's Michael and they don't do anything." He stomped away in a huff and will probably come to regret those words for two reasons. One is that the collision was not as clear-cut as Juan Pablo seemed to think. Perhaps when he has seen it on television that will become a little more clear. Top F1 drivers do not generally suffer from a failure to judge distances and so the incident was a bit strange and one might surmise from it that Michael Schumacher might have lifted off but there was nothing much to back up that theory. Even members of the Williams team said quietly after the race that Montoya looked to have just made a mistake. But the biggest mistake was the outburst after the race. Not because he will have upset the FIA (which he will have done) but rather because by ranting and raging he has shown Michael Schumacher that he is susceptible to pressure. He is not the Ice Man that everyone thought he was. And that means that in the psychological battle that exists between the top men, Montoya is at a disadvantage. He is quicker than Ralf Schumacher now but in the races he is not bring home the points enough to be a serious title contender. Ralf is doing that. The Williams-BMW drivers should have the advantage given the prodigious power of the BMW engines but Ferrari's new car is obviously good; the tires are being developed for Ferrari and Michael Schumacher is driving better than ever. The battles will ebb and flow as he season goes on but Interlagos proved that one should never make assumptions. Once Montoya was gone Michael was playing games. He let Rubens Barrichello through into the lead. The Brazilian was on a two-stop strategy and so had a big weight advantage but Michael knew that Rubens was not really a threat and that his primary objective must be to preserve his tires which he did cleverly. Barrichello went out soon afterwards because of an hydraulic failure, having convinced everyone that he was on a three-stop strategy. And then, as the laps rolled on, people began to realize that Michael was going for a one-stop race. It was a lovely strategy and a great piece of race car driving. Perhaps Ralf Schumacher could have pushed harder in the early laps if he had guessed what was happening but it looked as though Michael was on a two stop strategy and Ralf was content to be where he was. But it was too good to be true. At the pit stop the Williams men gave Ralf's front wing a couple of tweaks and the car was better in the second stint, but again Michael was playing with his brother. He was not fading when Ralf came chasing up behind him. He was simply saving his tires. As soon as Ralf looked like being a threat, Michael kicked again, just to show his little brother who is the boss. Ralf must have known but he stayed there hoping that Michael would make a bad mistake ” which of course he did not do. "People thought we were doing one thing with the strategy," said Ferrari's Ross Brawn modestly. "We did another. I was pleased with that. It was a tough race but it all fell into place. Michael drove the whole race beautifully." It was a tour de force. And great theatre but as the teams packed up on Sunday night a message had been delivered to Ferrari's rivals and in the psychological war that exists in F1 these days, it will be a tough blow for the likes of Williams and McLaren to take. Or to put it another way: Michael wins when he is supposed to win but he also wins when he is not supposed to win and none of the others come even close to that kind of brilliance. For the rest of it there was little of outstanding note. Apart from Michael Schumacher the race was completely dominated by the Michelin runners. The two Renaults went off the line as they used to do last year when they were using a clever starting system which was later banned by the FIA. It seems that they have found some other tweak to allow the drivers to make amazing starts. The first couple of hundred meters saw the McLarens swallowed up and they spent the first half of the race trying to get ahead of the Renault boys. McLaren showed its usual professionalism in getting both Coulthard and Raikkonen out ahead of the two Renaults but then it was all spoiled at the end when Raikkonen suffered a wheel hub failure. More points were wasted on reliability issues. The good news was that the McLarens were lapping quickly when not stuck behind the Renaults and that means that the team is getting back to a position in which it can challenge for wins. "You tend to see the true colors of the car in qualifying and it tends not to be such a big difference in the race," said David. "So I felt that we were going to be a little bit closer but I don't think we're quite there yet, we have got a bit of work to do. We obviously have not taken as big a step forward as the other cars during the winter. We know this car is a quicker car than last year's car when we did the back-to-back tests, but we just haven't taken a big enough step." The super-starting systems of the Renaults meant that the cars looked particularly good for the first part of the race but the laps times showed that once the McLarens were ahead the Renaults could not handle the pace set by the big teams up front. Trulli deserved better than the engine failure that was his reward. At the time he was running fifth. According to the Renault team, Trulli reported that he was "gutted" ” an unusual expression from an Italian. Trulli's misfortune was Button's gain and he also took advantage of the demise of Raikkonen to finish the day in fourth place, fighting off Montoya. The three points meant that Jenson is now fourth in the World Championship ” ahead of both McLaren drivers. The last point went to Mika Salo of Toyota. It was the Finn's second point in three races and once again there was an element of inheritance involved. But when all is said and done, the only thing that matters is that there are points in the bag. How they came about is not the issue. The Toyota is a reliable car and while it may not be World Championship-winning stuff it is a hell of a good platform from which to start a serious assault on the big teams in the years ahead. Allan McNish dropped out of contention after trouble on the first lap and then charged back until spinning off in the middle of the race as the car's handling deteriorated. "It is just fantastic," said team boss Ove Andersson, "but we still have a lot of work to do before we can score points without the benefit of retirements ahead of us." The two Jaguars came home seventh and eighth with Irvine ahead of de la Rosa. This was not bad at all given the recent performance of the team and a sign that the team is beginning to come to grips with some of the issues faced. The car still looks a bit tatty but only because there have been too many quick fixes to the problems involved. Time is needed and that, of course, is what is in short supply. Ninth place went in the end to Takuma Sato in the Jordan. The team lost Fisichella early on with an engine failure but he had no chance anyway as he had to pit at the end of the first lap having hit wreckage from the Montoya-Schumacher incident. Sato drove a steady race but admitted that by the end he was suffering from sore neck muscles. Villeneuve was classified 10th although he did not finish. The car simply stopped running. At the time Jacques was running in eighth place. Olivier Panis had a gearbox failure at one third distance. "We thought we had solved the reliability problems," he said. Mark Webber's Minardi came home 11th after what he reckoned was a good race despite problems with a fuel-metering unit. This meant that the computers kept saying that the fuel tanks were empty when they were not. This caused Webber to stop once more than was needed. In addition his pitstop after a collision with Massa was chaotic and lost the Australian a minute. Alex Yoong made it to the finish in 13th place, the two Minardis being split by Raikkonen's McLaren, which was classified 12th. Sauber lost both cars: Heidfeld with a brake problem and Massa in the collision with Webber. The only other team to fail to finish a car was Arrows. The cars both suffered from rear trackrod failures and the team decided it was best not to tempt fate too much. As a piece of theatre, the 2002 Brazilian GP will be remembered as a magnificent con job. Ferrari duped everyone and Michael Schumacher showed (just in case we forget) that he is far and away the best driver in Formula 1.